Abraham Lincoln, the ex-president of United States of America stands as a symbol of conviction to the world. 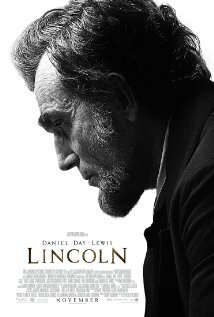 The Oscar winner movie 'LINCOLN' directed by Steven Spielberg has just spellbounded the world audience with its immense powerful narration. I had a chance of watching this movie this evening along with few friends of mine. I was just reminded of the nostalgia that 'GODFATHER' has left on us. I learnt a new face of Abraham Lincoln in this movie. Earlier, I remembered Lincoln for his repeated efforts in elections in spite of failing a lot of times and finally achieving the pinnacle of political power of USA, ie becoming the ﻿President of USA. I had learnt lessons of 'never give up' and 'try again and again' from those stories of Abraham Lincoln which I had heard of. In the movie 'LINCOLN', I got to see the humourous side of the same person. Probably now I understand the reason why he never gave up on competing in elections. His vision of serving people was very clear in his mind and having power in his hand was a dire necessity. The struggle through which Lincoln undergoes while he is determined to get the 13th ammendment to the constitution passed is a mere reflection of the mission of Lincoln's life. The hardships that he faces in his own family coupled with the lack of belief among his own peers failed to waver the amount of confidence that Lincoln had on the passing of the motion in the house.